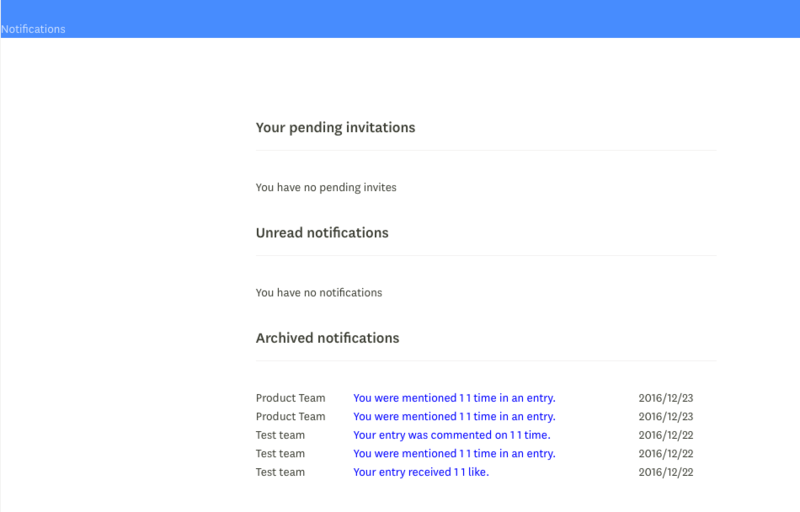 Notifications are alerts you receive in-app or via email when you have been invited to an Organization, your entries being liked or commented on, or when you have been @mentioned on any of your team's entries or comments. You can check for any in-app notifications on the Notifications tab located on the bottom right corner of the screen. On this page, you will be able to see any pending invitations you may have, unread notifications and archived notifications. I have some pending notifications. How do I mark them as read? If you have any pending notifications, there will be an option below the category, "Unread notifications". Simply click on the notification prompt, check off the notification or by clicking the "Check All" option. You can turn off notifications within your team settings, which is located in the middle section of the left side menu below the Members tab. Once on the team settings page, scroll to the Notifications category and toggle off which notifications you would like turn off. If you turn off notifications, you are disabling both in-app and email notifications! There is no way to disable just in-app or email notifications.